To pay tribute to Mongo Santamaría and Thelonious Monk, two legendary musicians of this or any era is challenge enough; but to pay tribute to them combining their enduring legacy is and always will be a Himalayan task. However, the magnificent conguero, Wilson Chembo Corniel has not only succeeded in doing this, he has excelled at it. Corniel is not only a master musician and arranger himself, able to think and dream in many languages; he is able to paint musical landscapes in a myriad colours. 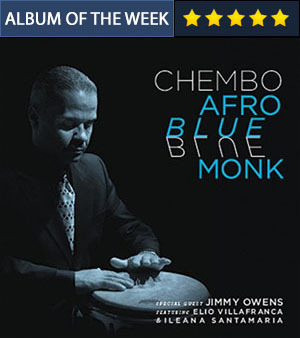 On Afro Blue Monk he also shows himself to be an astute band leader, for here he has assembled a stellar group of musicians who seem to be together not only for their virtuosity, but also for the unique and singular voices they bring to this music. This is special not only for what it does to Santamaría’s classic composition made even more famous by Coltrane and Monk in a none too familiar dialect, but it actually conjures up glorious imagery of the masters themselves in their favourite settings—that is to say, dialogues between Mongo Santamaría and his congas, or Coltrane and McCoy Tyner and Monk with Charlie Rouse. The difference here is that Chembo Corniel facilitates longing ache of Mongo Santamaría’s daughter, Ileana Santamaría’s gorgeous voice and Corniel’s congas as well as a harmonic discussion between the up and coming genius of pianist Elio Villafranca and the mighty saxophonist Iván Renta and again with Villafranca and elsewhere with the legendary trumpeter Jimmy Owens. On both—as on several other occasions throughout the record—these magical dialogues are enhanced with the majestic skills of Chembo Corniel himself. And what a beguiling experience it is when Corniel slaps the skins of his congas in a languid motion, turning one of the finest compositions of any time, “Blue Monk” into the dreamy Danzón or re-imagining the Santamaría song, which Coltrane made classic, “Afro Blue” into a stratospheric musical adventure. This is not to say that Corniel’s other masterpiece renditions of his tribute to the great Cuban pianist, “Emiliano” Salvador are any less beautiful, for they are every bit as memorable. Chembo Corniel is a percussion colourist who stands head and shoulders above most of his peers. His great artistry is informed by his flawless technique, which he embellishes with his consummate taste. Few percussionists living today (Giovanni Hidalgo being one of those exceptions) are his equal in the stylish manner of his musical diction and striking accents. 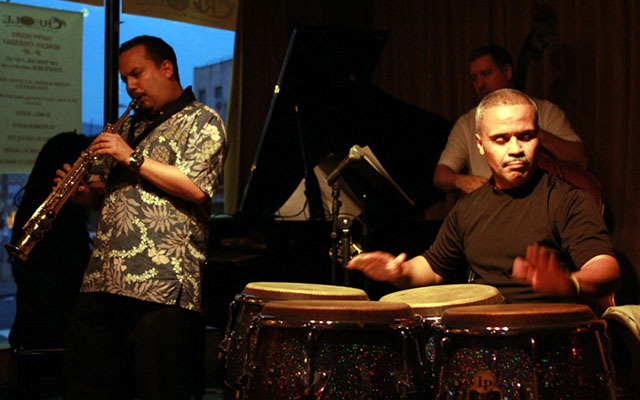 It is almost as if Corniel breathes life into the skins, stretched taut across the frames of his congas and batás. In fact Corniel is almost akin to an ancient druid who has some magical connection to the very force of nature that produces the echoes that pass through the gauntlet of time itself. In this regard, Corniel has a deep connection with the great ancestors, much like Santamaría and Monk had before him. With such a spiritual connection to music it is imperative that someone like Wilson Chembo Corniel must succeed. And this he most certainly does. In fact, this time around Corniel has surpassed himself with one of his most enduring albums. Tracks: Emiliano; Afro Blue; Hey, It’s Me You’re Talking To; Danzón Del Invierno; Blue Monk; Claudia; Don Quixote; Deluge. 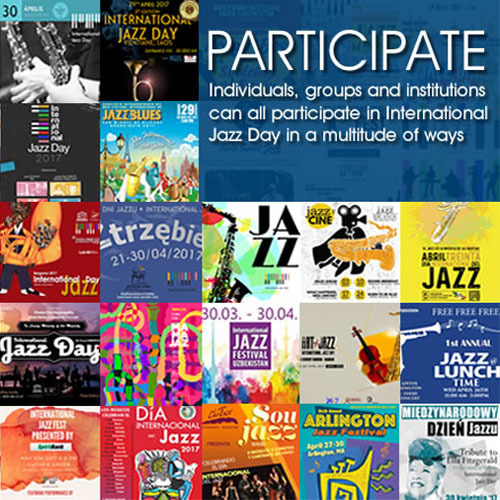 Personnel: Jimmy Owens: trumpet; Iván Renta: soprano saxophone, tenor saxophones; Frank Fontaine: flute, clarinet; Elio Villafranca: piano; Carlo DeRosa: acoustic bass; Vince Cherico: drums, guiro; Ogduardo Roman Díaz: batá; Diego López: batá; Wilson “Chembo” Corniel: congas, batá, percussion; Ileana Santamaría: vocals.